I reviewed this product a few months ago, am still in love with it but wanted to add that I received this product from the weeSpring Parent Panel. I'm so glad that I did because I wouldn't have gotten to experience this stroller which has made outings with my two young children a breeze! I received this Pathways Stroller from the weeSpring Parent Panel. Everything was packaged nicely and in great condition. The assembly of the stroller was pretty straight forward and easy. Its light weight and folds easily. I did have some difficulty with the stroller on uneven pavement on the sidewalk. That was a big turn off for me since it made walking the dog a bit more difficult. The seat seems comfortable and reclines nicely. Overall, its a great stroller but if you walk on sidewalks a lot, its not the one for you. 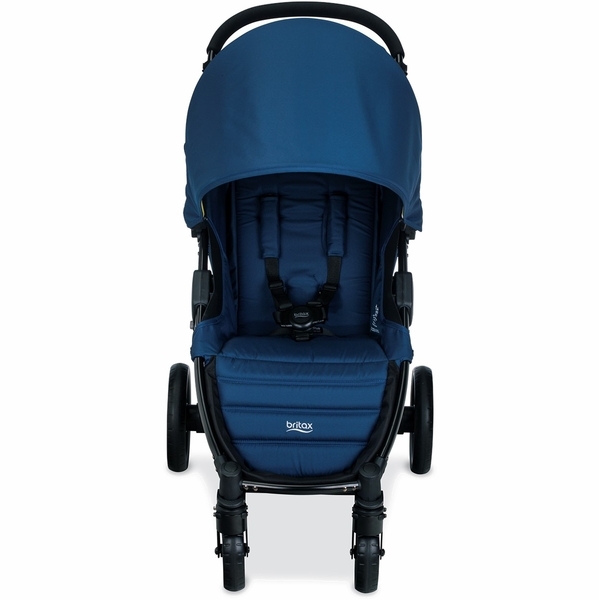 I got this travel system to try via Weespring Parent Panel, and first of all I do like the colors (i have the sketch one), very gender neutral. And i love the light weightedness of the car seat and how airy the canopy cover is. I do not like how the stroller is awful to steer! I was pushing it going around truns and it was awful to try an go around then because it was like the wheels didnt want to turn. I do not like how there is no cup holder thing at the too handle bar for moms. And I also did not like how there is no tray going across the stroller for the child or to make sure the infant seat is secured. It has the attachments for the car seat but its so flimsie i couldnt even put my son in it because it freaked me out that he was going to tip backwords. Overall, I would not buy this product. Excellent Stroller! For reference I am a mom of three (youngest 2 months) and I live in a suburb of NYC. Mostly travel places via car. Some air travel and some train travel into NYC. - A shorter person may want a handle that retracts a bit? - Basket under stroller not that large, but prob good for this size stroller? -Not great navigating bumps in the road. Wouldn't use as your main stroller if you live in a city. Overall this is a great stroller. Great for travel and trips to the mall or museum or outings. I don't think that I would use this as my main stroller if I lived in a larger city and had to go over potholes and rough roads. I live in the suburbs of NYC and would use to take the train into the city (easy to throw up on rack on train), for travel (this is my third child so space is at a premium), for smaller outings and for travel via air as I wouldn't be too concerned about it getting dirty or a bit broken (which I would with my more expensive stroller). I feel that this is a great stroller for the price! I am really impressed with this stroller. I love the bright colors and how easy it is to use. The storage compartments can easily hold everything you need for an outing. The seat reclines easily so it is great for using with babies and toddlers. Thank you weeSpring Parent Panel for sending me this stroller to review! I was given this Pathway Stroller to try as part of the weeSpring Parent Panel-and I sure am glad is it's become my new go-to! The Pathway Stroller is compact, yet it still offers luxury key points that I look for when choosing a stroller. First off, it was very easy to assemble-it took all of 5-10 minutes of my time. Once assembled, the first feature I took note of was the oversized canopy. The canopy features SPF 50 fabric which really helps shield your little one from the sun. It also has a mesh peek-a-boo window that closes by way of magnets so there's no need to worry about waking a sleeping babe with the sound of Velcro. Another feature I took note of was the well-padded seat-my daughter loves it so much that she often tries to use it as a seat while in the house! The harness is simple and can be adjusted with ease. The same can be said about the recline feature, all it takes is a simple pull or release of the straps located on the back of the stroller. As a taller woman (5'9), I was pleasantly surprised by the convenient height of the handle bar. I can push this stroller for hours comfortably. I also found the one-handed fold to be extremely easy-many products advertise this feature, however the Pathways Stroller really got it right. Finally, I want to mention the excellent quality of the wheels. Our rides have all been smooth and I can maneuver the stroller with such ease. Britax produces quality products, and the Pathway is no exception. I will use this for children to come! I received this stroller from the Weespring parent panel. This is a very sturdy stroller. I could tell from putting it together we will be able to get a lot of use from it. Nice lightweight and durable design makes it great for a walk around the neighborhood or just running errands . We are not ready for the seat recline just yet, but after playing around with it I think it will be a great feature to utilize. The one hand fold is a dream- makes it so easy to fold up and in the trunk. I can literally fold with one hand. Also, doesn't take up any space at all- so I have room for the stroller and groceries! The only drawback, if I had to pick one thing, is the basket size and placement. I was unable to use for diaper bag or many other bags due to size and the placement. I would high recommend this stroller to any established parents and the travel system to any new parents! I'm a new mom of two kids (2 year old and 2 month old).Having used a few different strollers in the past 2 years, I can say that the Britax Pathway Stroller is definitely is a great option. 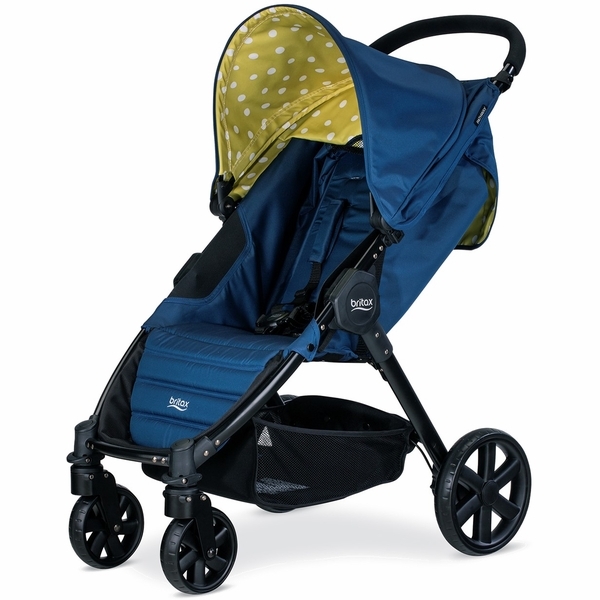 In comparison to other strollers I've used it is very lightweight, easy to navigate and great quality. My favorite feature of this stroller is how lightweight it is. I've had to load/unload other much heavier strollers into the car for the last two years and this stroller is so much lighter! It is still a bigger, sturdier stroller, but somehow weights a lot less. I love it! This is something I didn't know would be important when I was looking for a stroller the first time around, but really appreciate now that I'm on my second kid. The other thing that I love is that this stroller is part of a travel system. In the past I've had a car seat/stroller that were not compatible with each other and I'd have to wake up my son to transfer him to the stroller pram. It is so much easier when everything is compatible and part of a system. You can just pop the car seat in and be on your way without waking or disturbing the baby. Priceless. The folding of this stroller is fine, but since there is a lever you use in addition to the one-hand fold, it is not quite as quick and easy as other strollers I've used. This is fine, since it's still pretty easy to fold and the rest of the stroller is so great. Overall, this stroller is one we are excited to use for years to come. I think it will hold up well over time and be a great stroller for our family. Thanks to the weeSpring Parent Panel for providing me with this Pathways Stroller! I was so excited to see this stroller because it's the perfect "general" stroller. The stroller I end up using daily, when I need something more than an umbrella stroller, not a jogging stroller, not a snap and go (although it can be used as one). Just perfect for every day use. 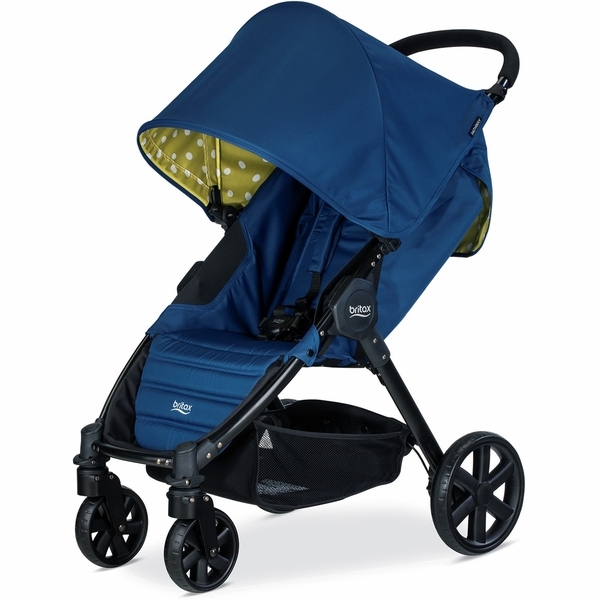 Wheels are good, seat reclines, LOVE THE EXTRA LARGE HOOD WITH UV PROTECTION, PARENT PEEP HOLE, AND ZIPPER STORAGE COMPARTMENT. The basket is big enough to keep a standard diaper bag, wheels are strong and secure. the best part is the easy one hand fold, although the stroller does not stand upright on its own while folded (but that doesn't matter to me). the stroller is lightweight enough for me to load and unload it into my trunk on my own, and to navigate up and down a flight of steps. I can easily see this fitting a newborn and being great straight until the child outgrows strollers completely. The stroller pushes easier than any other stroller I have ever seen. It folds easily, is lightweight, and doesn't take up very much space. This is the best travel system I have ever seen. My daughter is genuinely comfortable in the stroller even as an infant, but I can see that we wll use it for years to come. I got try this product as a member of the WeeSpring Parent Panel and I am so grateful!! I was given the Britax Pathway Stroller to try as part of the weeSpring Parent Panel. The Britax Pathway Stroller was easy to put together. I unpacked and put the stroller together in about 15 minutes at 40 weeks pregnant. I think the fold is a little hard to do one handed. I have had a couple different brands of strollers and this one is the hardest to get folded. The stroller is very light and folds pretty flat if space is a concern. The stroller is very easy to push one handed and to maneuver. The B-Safe Pathway Travel System is very easier to hook and remove from the stroller system. I will continue to use this when I only have one of the smaller children with me. For a mom on the go this stroller is a dream. It's lightweight and easy to maneuver and the one handed fold-up is the BEST. 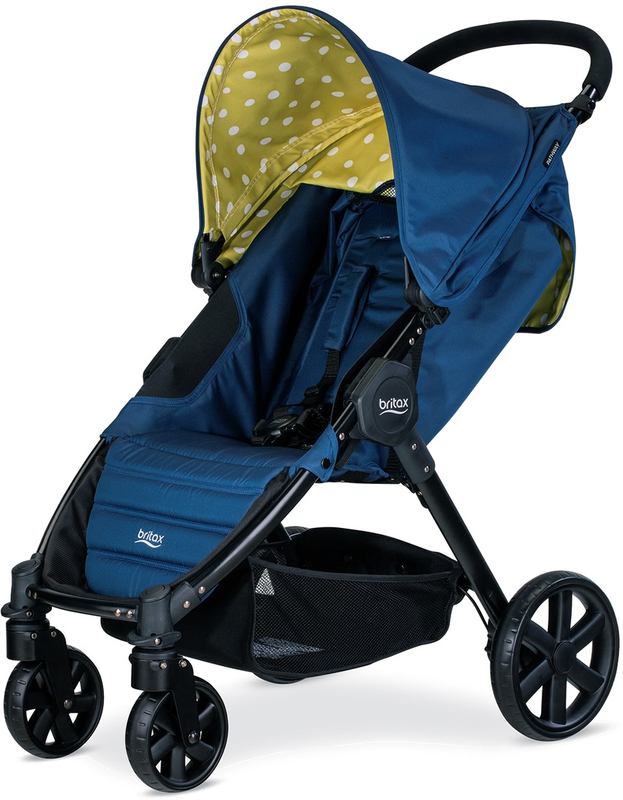 This stroller feels easy and travel friendly like an umbrella stroller, but is more durable to log serious miles for everyday use. The seat is padded, comfy and reclines all the way back to coax my toddler to relax. I love the huge canopy that keeps my kiddo well shaded from the sun. There is a peek through flap for added air-flow or just to play peek a boo. The polka dot lining is a cute design touch too. The storage on this stroller is great! Up top there is a zippered compartment that fits my phone, wallet, keys and a small bottle of water. The storage underneath is definitely big enough for my diaper bag and a shopping bag or two. Unfortunately, there are no cup holders so I have no place for my coffee, which these days is a staple. There also isn't a tray or cup holder for my toddler's snacks and water bottle. When I'm taking my infant out, the adapter to click in the car seat is super quick and easy. I also love having such a highly rated safe car seat that works with a great stroller. I received this stroller to review as a part of the WeeSpring Parent Panel. Great lightweight and easy to use stroller! I love this stroller. It is easy to assemble and easy to use. The one handed close is extremely useful, especially when carrying my little one. I love the extra zipper pocket by the handle. The stroller has a great recline and it is easy to change the straps to accommodate a growing child. The wheels allow for a smooth ride and is great for city use or for running errands. The basket is a bit small and hard to access, but as a compact travel stroller, this is a really great option. I especially love that this stroller is part of a travel system, allowing the stroller to grow with the baby and making my life easier as a parent! Thanks to the weeSpring Parent Panel for giving me the opportunity to review this stroller! I have nothing but positive things to say about this stroller. It was simple enough to collapse and very lightweight. Having a stroller that is compatible with the car seat for an easy transfer is a must so that I'm not disturbing my baby when he sleeps. My son is only 3 months old so I have no been able to take advantage of the full seat recline just yet, but I know when the time comes how convenient that will be. Though, I'd have to say that one of my favorite features of the stroller is the large canopy. This is because when using both the car seat and the canopy, I have the option of completely shading him from the sun. I have used other travel systems, and this is not always possible. All in all, this is a great stroller which will last you well into the toddler years. I received this product as part of the weeSpring Parent Panel. I was given this Pathways Stroller to try as part of the weeSpring Parent Panel. It was very easy to set up in about 10 minutes. The wheels popped in easily & securely, but were easy to remove should you want to. It is advertised as a 1-hand fold but I had to use both to get it collapsed. The more I did it, the easier it got. It has a latch to keep it closed tight, which was nice for moving it around and loading it in and out of the car. I LOVE how lightweight it is! The back reclined really far back & could be stopped at any point, which was nice compared to the fixed points of other strollers. With my daughter sitting in it, I could recline it with one hand, but when empty or sitting it up, it requires two hands. It says it's good for children up to 48", but my daughter's head (she's 36") was touching the canopy. The canopy is very large with a nice mesh viewing window with a magnetic closure. There is a pocket on the back which is very large when the seat is fully reclined, but shrinks up when the seat is more upright. The storage space underneath is a bit small for me, but I tend to over-pack, so it would probably be sufficient for the average person. It rolled and steered very easily on hard surfaces, & did pretty well on the grass around the playground. The car seat adapters are two small pieces which are easy to install and remove. I like that it's just the small piece on each side rather than a bar going across which would add more weight. The car seat easily comes in and out & it was easy to see where to align it. It holds securely, so my 2 yr old wasn't able to pull her 3 month old brother out! It was nice that the canopy from the stroller & infant carrier met up to provide complete shade. The fabric feels really nice & I love the bright colors! We walked around the neighborhood in 90* heat, & my daughter didn't get too sweaty. Overall, I really like this stroller. I received this Britax Pathway Stroller to try as part of the weeSpring Parent Panel. The stroller was super easy to assemble and use, and the color is so stylish with the bright red and black and white accents of the canopy. The simple clips make putting the carseat onto the stroller so easy! Also, the stroller works great for any age and stage, as some days I wear my infant and push my 2 year old in the stroller! It's nice that the stroller seat reclines and adjusts easily to allow for either rider. For both my infant and my toddler, it's nice that there is a large canopy on the stroller to allow for adequate sun coverage. I love that you can collapse the stroller with one hand (which is necessary with two kids), and even better is that it's lightweight and fairly compact enough to easily pick up and store in the car. The only cons are that the handle is a little shorter than I would like and does not adjust, there isn't a lot of storage space, and it doesn't handle bumps or uneven sidewalk very well. I'm not sure if it's the lack of suspension or the plastic (rather than rubber) wheels, but each time I came to an uneven spot in the sidewalk I had to push very hard to get over the bump. Aside from these things, I think it is a great, versatile stroller that is great for all ages and stages! From baby to toddler and back again! I received the Pathway stroller from the weeSpring Parent Panel and have fallen in the love with so many features it offers. I have a two year old and a 2 month old. I have used this stroller both with Bsafe carseat for my baby and on its own for my toddler. When you have two kids the baby things can really start to pile up. I love that this one piece of equipment works so well for both my infant and my toddler. It folds super easy although I do wish the button you push before folding was not needed. Often times I forget to push it and find myself fighting with the pull handle momentarily before remembering the button. The stroller is very lightweight making it very easy to get in and out of the car while holding a child. It unfolds quickly and steers seamlessly. It is compact so I can keep it in my car all the time and still have plenty of space for groceries or whatever else the back of my car needs to hold. The seat reclines back to a great level that allows kids to relax and roll comfortably. The two straps to recline and incline the seat can be a little tricky and does seem to require two hands which is a bit frustrating but the sun shade folds out nice and far to block the sun even when your child is reclined all the way back. I love that the stroller includes the zipper pouch under the handle. It is the perfect place to store keys, phone and wallet when out for a walk or running into the store. I definitely recommend this stroller and the whole travel system to any parent, whether they have a newborn or a toddler, this product is so helpful. I recently had my third child in June 2018. We were planning to use the same infant carseat we had used with our other daughter (born in 2014) and had bought a compatible stroller for it that we found at a consignment store. When the weeSpring Parent Panel provided the opportunity for us to test out the Britax travel system (infant carseat and stroller) I jumped at the chance as I really like travel systems when my kids are infants. It's just so easy to click the carseat into the stroller when out running errands. When the box came in the mail, my husband and I excitedly unpacked everything. My husband put the stroller and carseat together while I was nursing the baby. He came into the room and said "That stroller is awesome! It's like a Cadillac." He is definitely not someone who gets excited about baby gear so for him to be so excited about the stroller, I knew it must be great and couldn't wait to try it out. 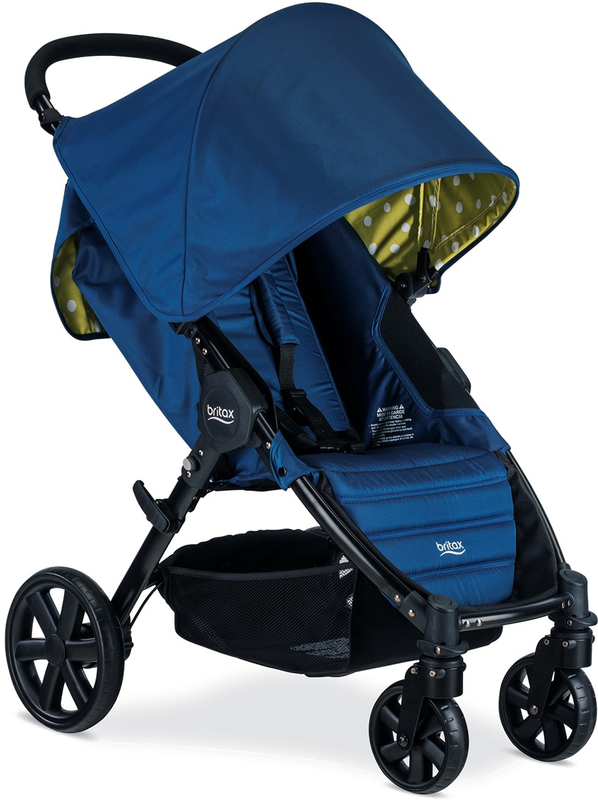 After using the stroller for about a month now, here are my favorite features: the large canopy - it actually provides lots of coverage and has a nice window you can look down and see your child. The canopy has a magnetic closure, which is really cool and so much quieter and easier than velcro (or not unattaching at all). The wheels on the stroller are a great size - they're sturdy and easily maneuverable. The stroller rides really smoothly. I also really like the one handed closure. It is very simple to fold up the stroller by pulling up on the handle, then you just lift the stroller by the handle into your car. It couldn't be more simple to fold and store the stroller. But just because it's easy to fold and store doesn't mean that it's flimsy. It is very well built without being bulky or heavy and I can tell that it will last us for many years. Another really cool feature is that the seat of the stroller itself reclines so you can use it with your infant before they can sit up on their own if they don't like being in their carseat or just to give you options. My baby really likes looking at the black and white striped design on the inside of the canopy. I also really like the inclusion of the large zippered pouch to put keys, phone, even diapering supplies etc in on the back of the stroller in addition to the large basket underneath. Three (pretty minor) cons for me are the size of the opening of the basket, the handle shape, and getting the carseat unattached from the stroller. The basket itself is a good size, but the opening is too narrow for me to get my diaper bag in. This leads to the second negative which is since I can't fit my diaper bag in the basket, my next go to option would be to hang it on the stroller handle. However, the handle on this stroller is one long bar, not two separate handles, so I can't hang my bag from it. It's not necessary a con because the handle itself is very comfortable and makes the stroller easy to push, but just keep in mind that you can't hang anything from it if that's important to you. Third, it always takes me 3-4 tries to get the carseat unattached from the stroller. I can always get one side to "unclick" but I have to jostle it around or click it back in and then try to remove it again several times before I'm successful. It's probably user error but it can get frustrating when your baby is fussy and you need to get them back into the car. Overall, we are extremely pleased with this sturdy, easy to use, beautiful and functional stroller and know that we'll be using it for walks, errands, and travel for many years to come. Thank you again to the weeSpring Parent Panel for the opportunity to use this stroller! I really like the Britax Pathway Stroller! I received this product from the weeSpring Parent Panel and have been pleasantly surprised with how awesome it is. It was very easy to assemble, (click in parts) and easy to read instructions. I love that this stroller has a soft cushioned seat and the seat size is long and amazing. The connector for the infant car seat was also easy to install, although the car seat kind of hangs in midair which doesn't seem as safe as one resting on the seat. Also the one hand fold isn't quite as easy as it may seem and i don't really like that the handle to fold it is in the middle of the seat right where your toddlers bum will go. All in all i really like this stroller, it is sturdy, and safe and is great quality that will last through all my kids. I would definitely recommend this stroller! The Britax Pathway stroller is super light! I love that about it and also that I can still click in the car seat which will be so helpful, especially in the winter picking of my older child from school, etc. the stroller is well made and has the same material as the car seat so they match well. It has a spacious seat so my baby will be able to sit in it well into the toddler years. I love that the seat folds down nearly flat so she can lay in it as a younger baby when we go on walks and she is secure. There is a storage basket underneath and it is spacious, but I wish it was open more in the back to be able to put larger items in it. The stroller also has a zip pocket for mama, and it will hold a wallet, phone and keys easily. I do wish that it came with a cup holder for mama and baby. It looks like their are accessories that you can purchase to have a cup holder for mama and a cup holder and tray for baby. It also has an accessory you can purchase to have an older child stand on behind the stroller in between Mom and the stroller handles, which looks like it could be really helpful for a preschool age child that doesn't want to walk or on longer walks or at an amusement park. The stroller was easy to close, but really you do need two hands for it to be easy. With some practice it could be done one handed but not as easily. Taking it from my trunk and opening it is really easy and smooth. I also really love how smooth it rolls and easy to push and turn it is! Overall, I am pleased with this travel system and plan on using it for several years! The Britax Pathway Stroller arrived in a nice compact box. It was very easy to assemble, maybe taking 5 minutes. You had to unwrap it, snap on wheels, sunshade and infant carseat adaptors. This stroller came in the Connect color. A navy blue with yellow/white polka dot sunshade interior. I enjoyed this color combo and thought the polka dots to be very cute and fun. The sunshade has a peekaboo mesh window, is UV 50+ and has a large pocket to store things. The sunshade is oversized and provides ample shade. My daughter's were both happy with this large shade feature. The seat reclined all the way to a flat position. This makes nap time easy when on the go. Large sized storage basket. This stroller turns very well and is I would say is of medium weight/size. Lighter/smaller then a jogging stroller but bigger then an umbrella stroller. The infant carseat snaps in easily . Making going from the car to errands a breeze! I love this feature. The infant carseat if you purchase the travel system comes with matching colors. Navy blue and yellow/white polka dot interior. To fold the stroller requires one hand and folds up to a nice compact size for storage in the car. I really enjoy how small this stroller folds up, the cute colors and that it comes in a travel system for easy travel/errands. You can easily use this stroller for years to come. Infant until the child outgrows the stroller several years down the road. This makes this stroller a great purchase. What parent doesn't love something that will provide you with years of use for your child. Thanks to the weeSpring Parent Panel for providing me with this product. 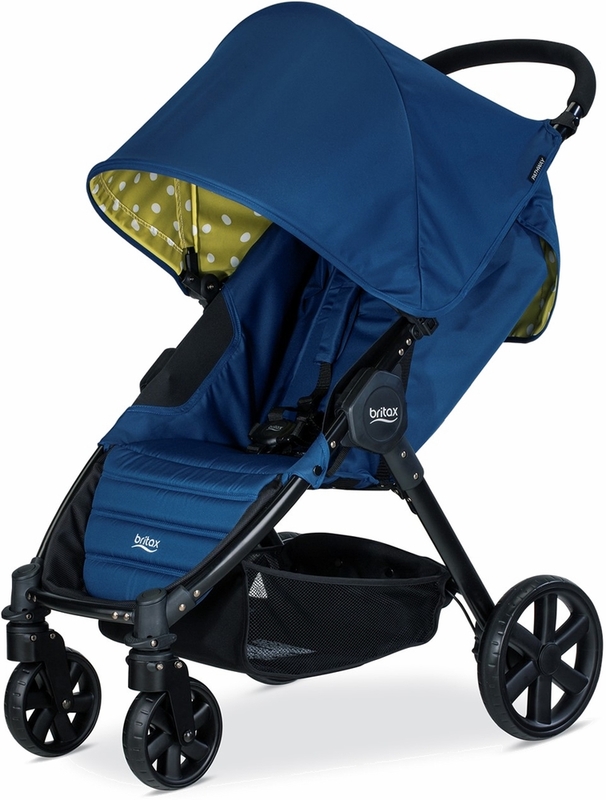 The Britax Pathway Stroller is absolutely divine! The bright color and pattern are beautiful and catch baby's attention nicely. The one-handed fold is the easiest I have ever used with any of our children. The handle is nicely cushioned and simple to steer. The carseat adapters were easy to attach and keep the infant seat very secure. The canopy window has invisible magnetic closures that are quite efficient. The stroller wheels are sturdy and work well even on large gravel. I love this stroller as part of the travel system but will be equally pleased to use it after we've outgrown the carseat. This is an awesome stroller! I really like the bold colors available and how easy it is to fold up (one handed) and put in the back of my SUV. My favorite feature is the easy recline which allows me to easily raise it or lower it depending on if I use it for my 3 year old or my 3 month old. My 3 year old really likes it and asks to go for rides in it all the time, so it must be pretty comfortable. I know that I will be able to use it for several years before my children outgrow it so it will be the only stroller I will ever need! The storage on the stroller is amazing as well. It has a large basket to place items in below it as well as a zippered storage compartment by the handle which is great for cell phone and keys. Thank you weeSpring Parent Panel for sending me this travel system to try and review. The Britax Pathway is a great stroller. It combines three of the best features: safety, ease of use, and style. I should say four if you add in affordability! Having a stroller that's part of a travel system is extremely important to me because I dislike putting the baby's car seat in a shopping cart, We know that it is extremely dangerous to put an infant seat on the top part of a shopping cart and putting them in the larger section leaves no room for merchandise. Problem solved with the travel system. The bottom basket on the stroller is very spacious and I'm not putting my baby in any danger. The one-hand fold makes getting in and out of the car very quick. Which is super helpful with four kids and a baby in your arms. I feel like the stroller rides and turns very smooth. It's sturdy and is not going to bend or break like other strollers I've used in the past. Thanks to the weeSpring Parent Panel for providing me with this product. It will be a part of our family's everyday adventures. Thanks to the weeSpring Parent Panel for providing me with this Pathways Stroller. This is a great practical stroller. Fits great in the back of my car. The seat recline is a great feature...works for my newborn and I can imagine it will be good for naps as he gets older. My favorite feature is being able to fold the stroller with one hand (especially when you have a child in your arm!). Another feature I like is the zip storage by the handle bar, it's great for my keys and phone. This is definitely a stroller that will work for our family over next 4 to 5 years until my child outgrows it. I have 4 children (youngest is 2 months old) and have owned/used 5 other different strollers. Upon un-boxing, the stroller took me roughly 5 minutes to assemble (mostly one-handed while holding an infant), so that was lovely. The stroller can easily be collapsed one-handed (it does not stand up on its own when collapsed); however, you do need two hands to unfold it. It collapses quite compactly and would probably fit in even the smallest trunk. The stroller can be steered with one hand, has a smooth ride, and even though the handle is not very tall neither myself nor my husband ended up kicking the wheels/axle or had to shorten our stride. I really like that it can be fully reclined for an infant (with a 5-point harness for safety) and has an extra-large (quiet-fold!) canopy (those features are not as common).The B-Safe infant carseat is easily snapped in and removed from the stroller using the adapters (if you are using it as a travel system). It does not come with any cup-holders included, so those would need to be purchased separately. The mesh basket underneath is an average size; I could probably squeeze my diaper bag into it, but would not be able to access anything inside without removing it from the basket (I just ended up clipping my diaper bag onto the handle with its own stroller straps). The mesh panel at the back of the reclined seat is a nice touch for extra airflow in the summer. Features I never know I would love! We started using it right away and loved the ease in which we could switch from using the car seat to using the stroller seat. The small inserts that are added for the car seat are unobtrusive and make the seat fit nice and low, which seems safer than some other strollers that have the car seat sitting much higher making it seem top-heavy and susceptible to tipping. Having four wheels also makes the stroller feel more stable than a 3-wheeled stroller I've used in the past. The variations of inclines have been great; as my infant gets older and is able to sit up and wants to see more, we can quickly adjust from laying almost completely flat to an incline that fits her current ability. I never thought that I didn't like the brake on other strollers until I used this one while wearing sandals - so easy! The weight and one-handed fold of the stroller make it great to use in all the situations we've needed it for; its versatile enough and light enough that we can easily hand the stroller off to grandparents or babysitters and not have to worry about it being too difficult to fold, lift or fit in the car. The canopy on the stroller that meets up with the car seat canopy is another helpful feature for the early summer walks with newborn; we were both able to get some fresh air without me being worried about her being exposed to too much sun. Overall, I've been extremely happy with our use of the Pathways stroller and would definitely recommend it. I foresee this being a stroller we are able to use until all of our kids outgrow stroller use! As a mom of three under the age of six; with our newest only 12 weeks old, I need products that will last through all stages of development. We are an active family; always outdoors frequenting parks, farmers markets, attending various festivals and other activites in our city, so I seek out products that are dependable and aesthetically pleasing. 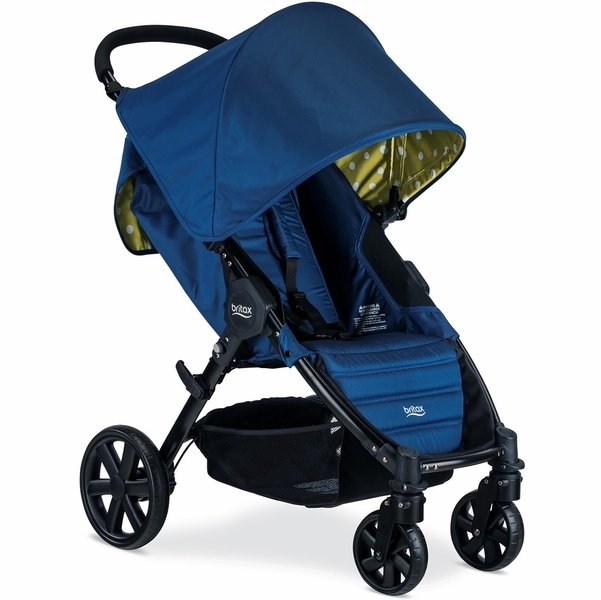 The Britax Pathway Stroller is all that and more. The black and white stripes are beautiful against the red; not to mention a great visual stimulation for baby - great for development! Stylish. Modern. Win. Win in the aesthetic department. The pocket attached to the canopy is large enough for all your parenting essentials but I do wish the storage underneath couls fit my diaper bag/shopping bags. Since we do spend quite a bit of time outdoors the UV50+ rated extra large canopy is very nice. Our five year old still falls asleep while we are out and the canopy will cover him. At 48 lbs and 4 feet, he fits comfortably in the Pathway compared to our double. With a 55lb weight limit, I imagine he will get another year or so out of it. The wheels are plastic and although they roll smoothly on concrete/asphalt/laminate I do wish they were rubber. Rubber wheels would allow the stroller to roll more smoothly in grass and gravel. 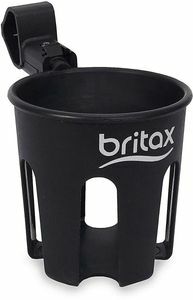 Personally, that doesn't take away from all the other great features the Britax Pathway offers. I received this product as a travel system, all thanks to the weeSpring Parent Panel, and I love the ease of transferring baby from stroller to car. The car seat offers the same red and black and white stripes - I love the matching! I can smoothly put baby in car, pickup my toddler, and while he is flailing on my hip I can fold the stroller one handedly with the pull strap! In the five and half years I have been navigating motherhood, I have never owned an easier stroller to fold! This stroller also locks automatically upon folding, so that means no more bruised shins while loading in the vehicle. I believe this is my favorite feature as a busy mom. Our life is wonderfully hectic so the fact that I can lift this stroller one handed due to the lightweight is AMAZING! I highly recommend this stroller to any new mom! Thanks to the weeSpring Parent Panel for providing me with this Britax Pathway Stroller! The all-wheel suspension system ensures a smooth ride, the linked parking brake locks both rear wheels with a single step. The roomy underseat storage basket and a large zippered storage pocket fit all of baby's on-the-go essentials. One-hand, quick fold design makes it easy to store and transport. 4-wheel configuration with swivel front wheels helps you navigate with steady confidence. Large under seat storage and a large zippered storage pocket fit all of life’s essentials. All-wheel suspension system ensures a smooth ride.